Three years ago, I was part of a small group of parents who set out to create a healthy lifestyles initiative at our school. At the time, I was in my second year as PTA President and this effort was viewed as “Liz’s Thing.” I was even called “The Fun Killer” (I didn’t take it too personally…). Many people in our community saw this movement as confrontational; they were not happy about fruit vs. cookies or water vs. juice at potlucks and school-wide celebrations. When we eliminated bake sales that year, it was the final straw. This change was too much, too fast. Healthier lifestyles at our school was going to be more of an uphill challenge than I could have ever imagined. And, we didn’t get very far. With my tenure as president long over, last spring our group reconvened. We talked to more parents, the principal, teachers and professionals. We created a school-wide Wellness Committee and were upfront about our failed attempts to create a healthy lifestyles initiative. We applied for the PTA’s Healthy Lifestyles Energy Balance 101 grant, which we received! We were convinced that the framework provided by the grant could improve the message to our community. As it turns out, it still has not been easy and I often still feel like a salmon swimming upstream. An all-school Dance Party, a Community Cooking Class (hopefully) and a Wellness Photo Wall before the school year ends. 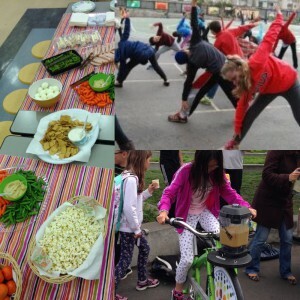 We have monthly Fitbucks drawings and have given away jump ropes, shoelaces, schwings (wings for shoes), an hour on a smoothie bike to the winner’s classroom, a school-logo apron and book for those who attend nutrition events, and two yoga mats! There will be an end-of-the-year Fitbuck drawing for a grand prize. The students LOVE the monthly drawings. I feel like we are on the road to “branding” the Fitbucks idea, while also generating interest and even excitement in the Wellness activities. Most importantly, our students are a formidable resource to reach their families about Wellness Committee offerings. I know that change is not easy. And I know that our committee will not accomplish everything we set out to do in our grant. But, we have been more nimble and flexible and learned to “read the tea leaves” better. This is my ninth and final year at our school, and I’m excited about the direction that things are headed. Some new families are energized and are willing to continue the healthy lifestyles message. And, I’m hoping that maybe, just maybe, next year will be a little easier. Liz Isaacs is the Wellness Committee Chair at Dianne Feinstein Elementary School. She served on the PTA Executive Board for seven years, as President and in community building and advocacy roles. She is married and has three children in San Francisco public schools. Well done, Liz–and all those who have worked with you! Hello — Thanks for posting. I shared this on our school web site, got a great conversation started. Those cupcakes piled high in sugar-bomb fat make my stomach turn, yet a lot of people will defend their right to fatten up my children at school, or otherwise feel wounded about the ban. Fascinating. Anyway, *if* you’re interested, we’re trying to keep our school free of artificial sweeteners, and we’re at UPark PTA on facebook.